Have I posted these already? 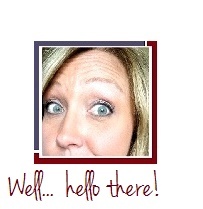 I'm not sure if I have, but here they are again never-the-less. Since I'm not a drinker, when I do have a drink I'm particular. These margaritas are one of the only ones I like! In a blender combine the limeade, tequila and triple sec. Add the ice cubes and blend until smooth. Rub the rims of the margarita glasses with the cut lime and dip in margarita salt. Serve! Earlier this week I bought a package of garlic & spinach chicken sausages. I've bought them once before and didn't really know what to do with them. We cooked them and browned them and sliced and ate them with a side dish, but they really just wanted to be used 'in' something, I could tell. I decided to use what I could from our garden as well as the sausage, and what I ended up with was a delicious, wonderful recipe that is now copied down in my recipe book for future reference. Saute the onions and zucchini in the olive oil over medium high heat. 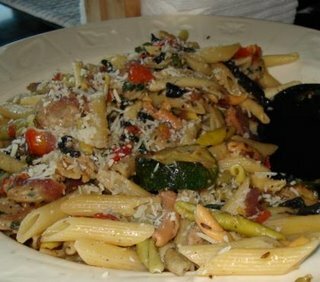 Put the golden zucchini and onions to the side and add the sliced chicken sausage and tomatoes. Stir until the sausage is golden and mix in. Add the seasonings; salt, pepper, caraway and basil. Cook the pasta while making this and after draining, add to the sausage mixture. Sprinkle heavily with fresh grated cheese and serve. I easily served 6 with this recipe. 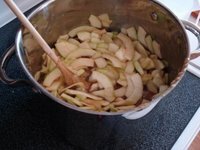 Apple... Errr... Zucchini Pie? 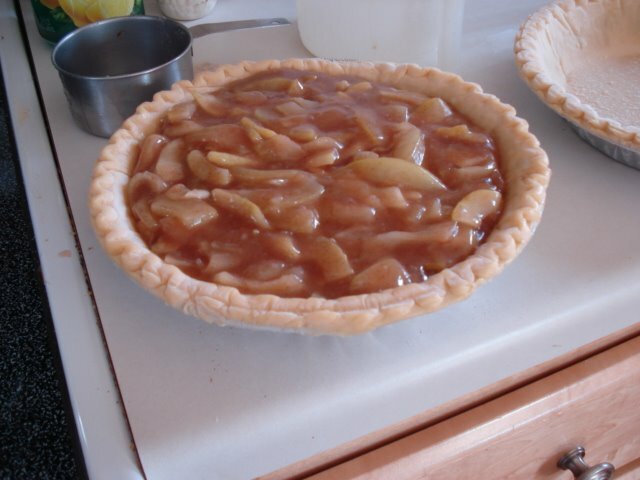 ZAPPLE PIE! 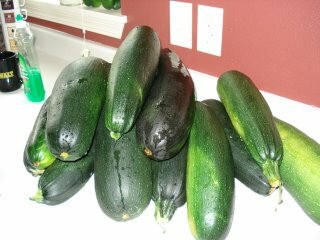 In a saucepan over medium heat combine the zucchini, sugar, butter, vanilla, cinnamon and nutmeg. Add 2 T lemon juice. Stir to mix and cook until tender, about 10 minutes. Mix the rest lemon juice and water with the flour in a cup and stir into the zucchini mixture to thicken. Remove from heat. Spoon the zucchini filling into the pie shell. Place the top crust on and crimp the edges to seal. Put the pie into the hot oven and close the door. Then reduce the heat to 350. Bake for 25-30 minutes until the top is browned and the filling is bubbling. Cool completely or slightly warmed to serve with a scoop of vanilla ice cream. 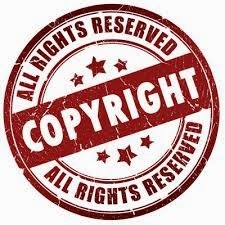 *One of the original recipes called for 3/4 c sugar and 1/2 c of lemon juice. I found it to be too much lemon and not sweet enough. Increase or decrease according to taste. 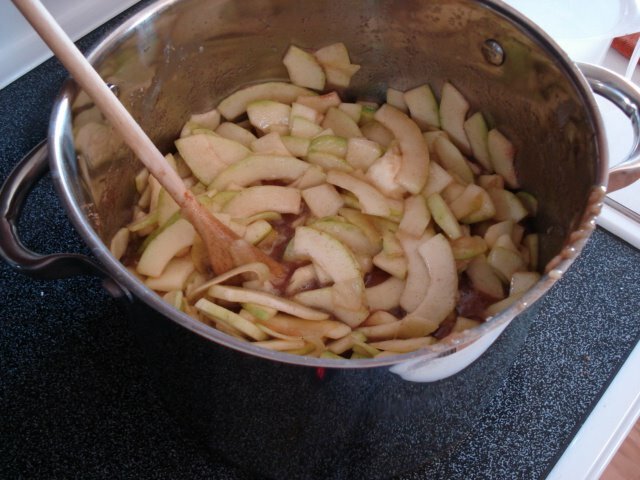 I also used 3/4 white sugar and about 1/2 c brown sugar. I made this one for my sons birthday. It was a huge hit and my husbands first words after taking a bite were; "It's a keeper!" I used two different recipes though, and just kind of muddled my way through. This is the end result. 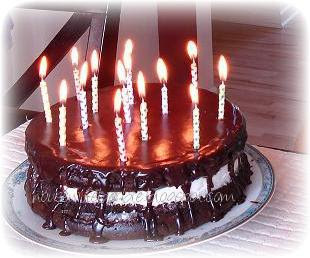 Make the cake according to directions and bake in (2) 8 or 9 inch round pans. Follow the timing on the box (averages 32 minutes). Let cool completely. Slice the tops off to make them completely flat and even. Beat the filling ingredients until light and fluffy. With a KitchenAid mixer this only takes about 3 minutes. With a handheld it may take up to 7-8 before it comes together. Spread the filling over the cooled cake and top with the second cake. Press down lightly to flatten and make even. Microwave the frosting for about 20 seconds until it's pourable. Drizzle the frosting over the sides and then pour 1/2 - 3/4 on top. Smooth with a butter knife, spatula or frosting knife. 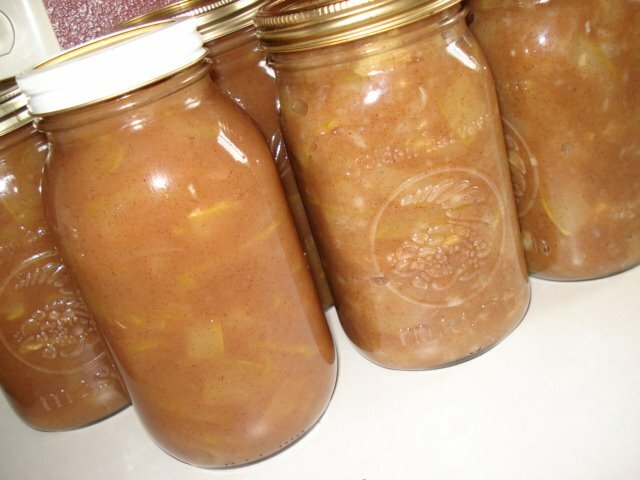 Cover loosely and refrigerate at least 24 hours. Here is feedback from a reader sent by email re; the cake! delicious, and this one ROCKED! Thank you so much!! If you have a pasta machine in your home, I sure hope you are using it! Even before I bought mine (back around 1993 or 1994) I made homemade noodles and ravioli by rolling the dough out by hand. It's worth it... every minute of it... but if you have a pasta maker then there is no excuse to not drag it out and use it at least once or twice a year. It's so easy and so relaxing! Using your favorite pasta dough you divide it into 4 equal portions and let them set for 20 minutes while you assemble the rest. Place into the bowl of a food processor and whirl until smooth. Process just until it gathers to a ball. Let set 10 minutes before working with it. Roll it out very thin on a lightly floured surface, or if you have an Italian pasta machine, roll it out in portions starting at 1 and thinning it down to a 3 or 4. If you have rolled it thin by hand, now use a pizza cutter to slice it into 1/2 inch strips, or even 1 inch if you like your noodles wide. 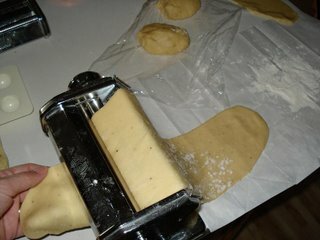 With the pasta machine, make it into noodles if you have the attachment or lay it out and use the pizza cutter as well. This pasta is also perfect for making homemade ravioli with if you cut it into squares, fill and seal instead of slicing into pasta strips - SEE BELOW. Use right away by dropping in boiling water and boiling for about 8 minutes. 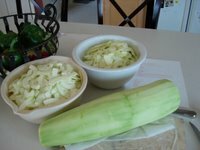 Toss with butter, salt and pepper or your favorite sauce or use in a chicken noodle soup! If you want to let them dry, just let them dry on the counter overnight, flipping the next morning and continuing to dry or if you have a Pasta Drying Rack, let hang over night or to the next day until dried. Store in a sealed ziplock in the freezer until use. In a food processor bowl, place the salt and flour. Put the top on and while pulsing or running on low, add a teaspoon-ish of oil and start adding eggs. You probably only need 3 eggs so start with that. Add your jalapenos. I used 2 small jalapenos and the dough was so mild even children could eat it without spice. If you know you like jalapeno's, use more. Process until the dough forms a ball shape. If it hasn't gathered itself in a ball by the 3rd egg, you can add another teaspoon of oil or water or use a 4th egg. Water or additional flour by the teaspoon will give you the texture you need for it to be a ball. Let it rest 10 minutes. Then either roll very, very thin with a rolling pin or use a pasta machine. 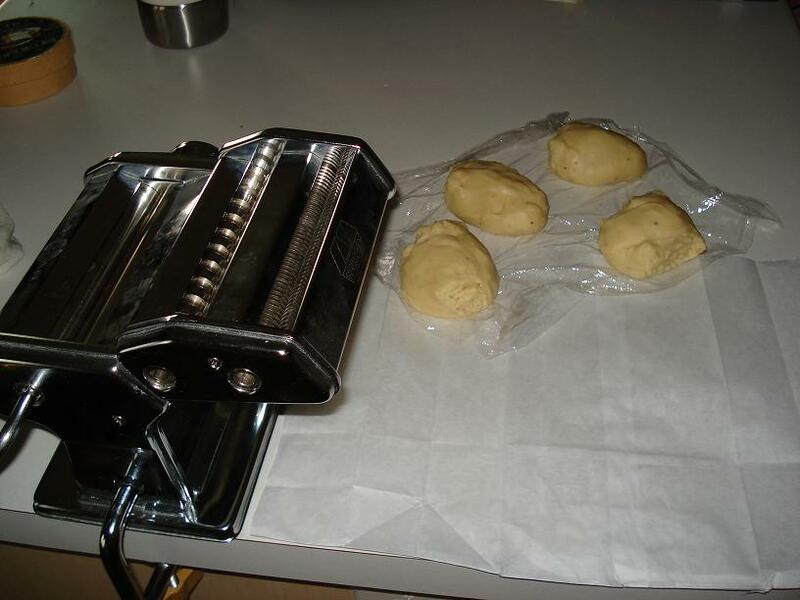 I use a manual, hand crank pasta machine and starting with number 1, I run it through to a number 4. 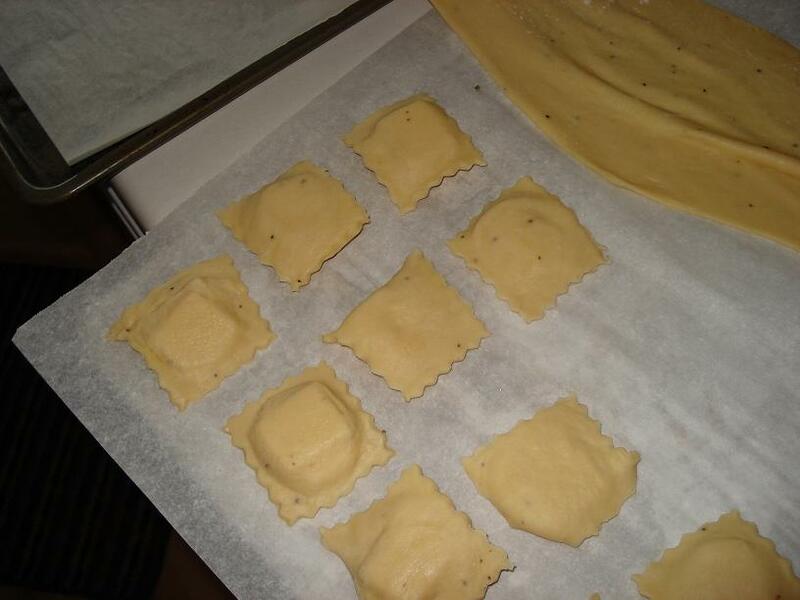 You can then cut into thin noodles or use wide sheets to make homemade ravioli. Using the largest setting (1) feed the pasta through the machine and crank the handle slowly to allow for stretching. Repeat, and then move the number to (2), crank the pasta through and each time move the number one digit higher. I like to keep my pasta around 4 or 5 for noodles and ravioli. Any thinner and it tends to rip too easily. Now the fun part! 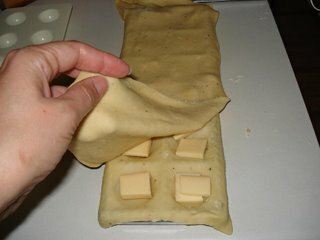 If you have a ravioli maker (as I do in the photos) you lay your pasta sheet across the top and use the white mold to push the pasta down a bit. Remove and fill with your favorite filling. Top with a second sheet of pasta. If you don't have a pasta maker, you make it the way I used to; lay the sheet of pasta on a lightly floured surface and pile teaspoons of filling 1-2 inches apart evenly over the entire sheet of pasta. Use a pastry brush to brush water or egg white around and inbetween each filling. Top with a second sheet the same size and press around each ravioli. Use a pizza cutter to slice into even squares. 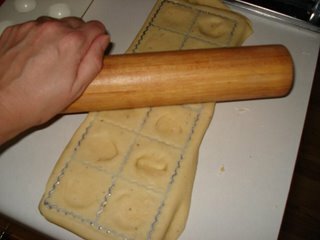 After topping with the second sheet, use your rolling pin to roll across the top, cutting each ravioli apart and sealing it. Pop each ravioli out (or if by hand, place them one by one) on a cookie sheet and if you are going to use them right away, place them into simmering water and simmer them 5-8 minutes until done. I like mine with alfredo sauces or butter, but you can also serve with spaghetti sauce or whatever your favorite pasta sauce may be. If you are going to freeze them, freeze them on the cookie sheet until frozen solid. At this point they can be frozen in a larger bag. junay: Yes - boil them frozen. If you do thaw them you would have to lay them out individually on parchment so they didn't touch each other and stick. You could do this of course - but it's so much easier to cook from a frozen state - just as if you bought them from the freezer section of the grocery store.